The driver-focused, honest-value and affordable second-generation Suzuki Swift is being replaced. Long live the all-new, driver-focused, honest-value and affordable 2018 Suzuki Swift! 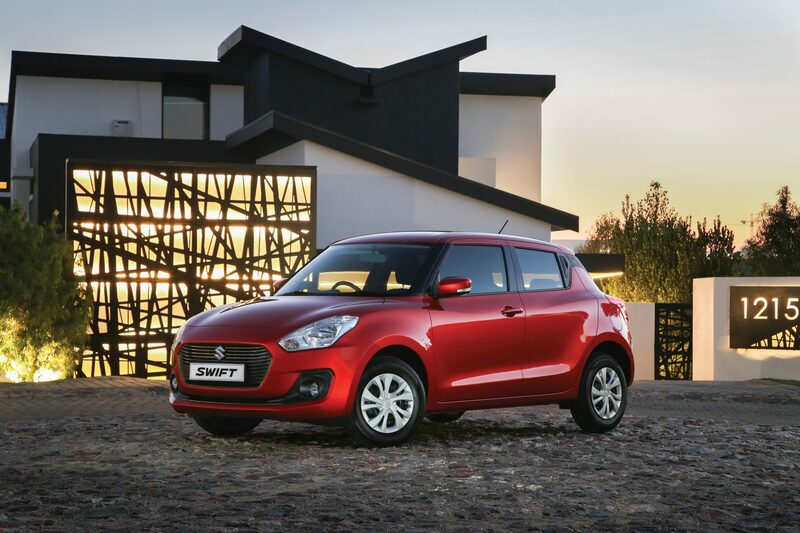 The new Suzuki Swift has landed in South Africa after making waves abroad, winning awards such as the RJC Car of the Year in Japan, the Scottish Compact Car of the Year and being named a top three finalist of the World Urban Car of the Year. 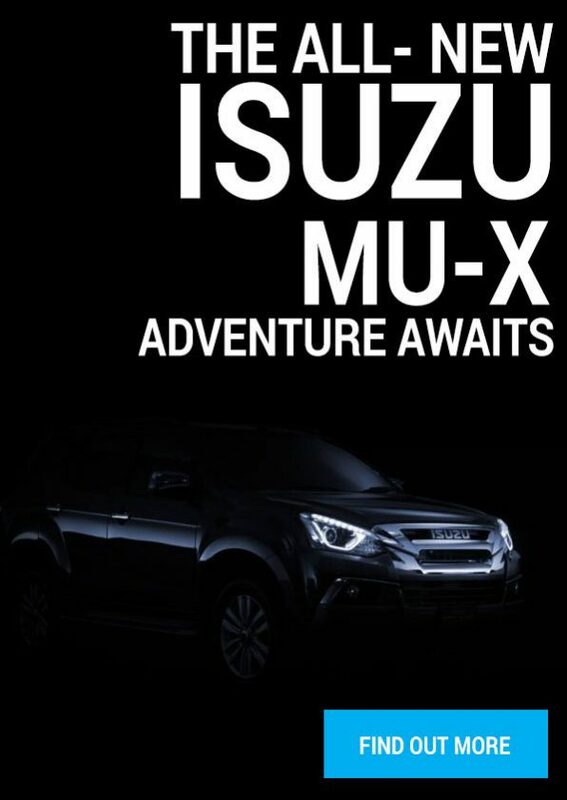 It is available immediately at Suzuki dealers across South Africa. 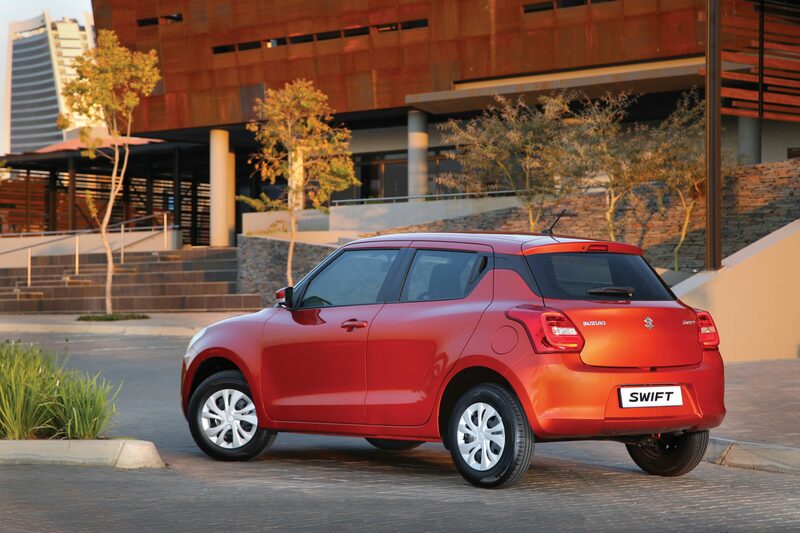 “The all-new Swift has big shoes to fill. It follows on two generations of our most popular model, which had sold over 19 000 units to date. In fact, the previous Swift was so popular that it reached its peak sales volume of 2 966 units in 2017, the last full-year in which it was sold. 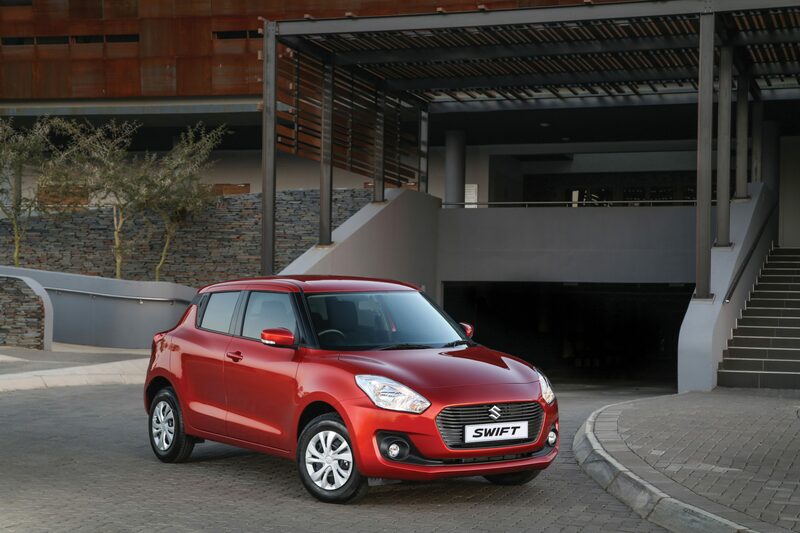 “But judging by the new model’s sales performance abroad, we believe that the Swift brand is in good hands and that it will continue to delight customers and driving fans alike,” says André Venter, divisional manager for sales and marketing at Suzuki Auto South Africa. The first of three generations of Suzuki Swift was launched in most global markets in 2005. It also spearheaded Suzuki’s entry to South Africa in 2008, before being replaced by the second-generation model in 2011. Both first- and second-generation models have proved to be highly popular. In South Africa, the model represents roughly 30% of all Suzuki sales and globally more than 6 million units have been sold. When Suzuki first revealed the Swift at the 2004 Paris Motor Show, it surprised the crowds with its bold headlights, blacked-out A- and B-pillars and sloping roof. This silhouette, which mimics the look of a racing helmet, and its width-over-length preference, became the foundation of the Swift’s distinctive visual signature and it has been carried over to the all-new model. For the 2018 model, Suzuki’s designers have integrated and reinterpreted this visual signature and added new styling elements such as rear door handles in the C-pillar. This makes the new model both completely new and completely Swift. Ticking the box for iconic design elements are a modern interpretation of the Swift’s bold vertical headlamps. Also present are the blacked-out front (A) and centre (B) pillars, which have been further accentuated with a blacked top-section on the rear (C) pillar to create the impression of a floating roof. The all-new Swift has also retained its predecessor’s strong shoulder line, which has been redesigned to be both bolder and less angular. The new model’s shoulder line now runs from the front door handles to the front and rear lights, widening across the wheel arches on both ends to create muscular character lines over the fenders and wheels. At the rear, the line edges over the new rear lamps, while at the front it skirts the headlamps and touches the upper edges of the new polygonal grille. Suzuki has moved the rear door handles to the blacked-out section of the C-pillar to create a balanced look to the shoulder line, the impression of a floating roof and a sportier side profile. At the front, the design is particularly striking. 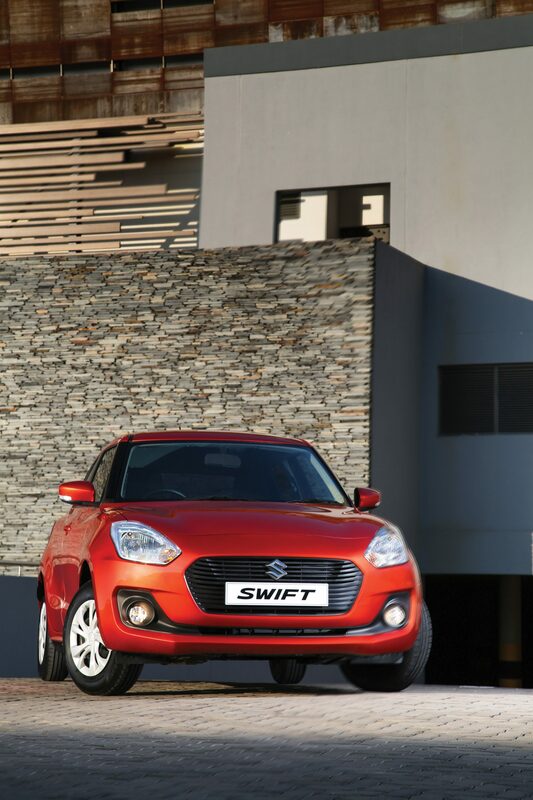 The all-new Swift has a new grille with large Suzuki badge and a wide and narrow secondary grille. These elements visually lift the height of the nose, while retaining aerodynamic efficiency. At the rear, the luggage door has an integrated bulge that rounds off the shoulder line, while an additional high-level LED stop lamp is integrated into the discreet roof-spoiler. The rear brake lights also incorporate LED technology. From the outside, the high-spec GL-models can be distinguished from the GA-specification level by its wheel cover design, colour-coded side mirrors with integrated turn signals and the addition of front fog lights. 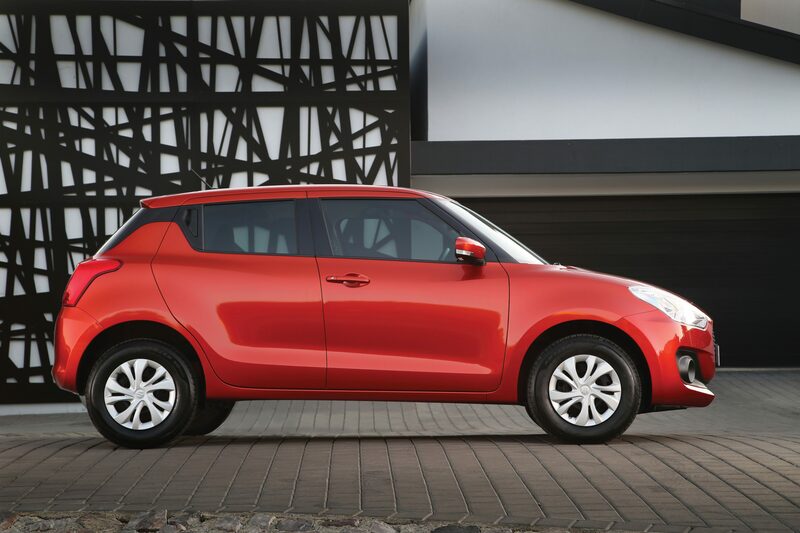 Suzuki has widened and shortened the body with the design of the new model, to concentrate the Swift’s distinctive squat stance. At the same time, both the front and rear tread and the overall wheelbase have been increased. The new model is 10 mm shorter and 40 mm wider. The front track has been widened by an equal amount (40 mm) and the rear track is now 35 mm wider, while the wheelbase has been stretched by 20 mm to 2 450 mm. This places the Swift just 20 mm shy of the Suzuki Ciaz. The new dimensions have allowed the designers to increase interior space, especially for rear passengers. Rear passengers now have 23 mm of additional head room, while front occupants benefit the most from the additional body width with 10 mm extra shoulder room. Both front and rear occupants sit lower than before, which lifts the side glass to shoulder height for a sportier driving experience. Behind the occupants, Suzuki has stretched the luggage area to 268 litres. This is a massive improvement of 58 litres over its predecessor and is further benefitted by the fitment of a 60/40 split and foldable rear bench seat on the GL-specification level. GL models are also fitted with an additional luggage area cover. Inside the cabin, Suzuki has retained the Swift’s “driver first” design philosophy, while further improving the quality and tactile feel of the cabin materials. The driver-first philosophy is most evident in the new model’s D-shaped sporty steering wheel and redesigned front seats that offer firmer support for less fatigue on long journeys, especially for the upper body and shoulders. 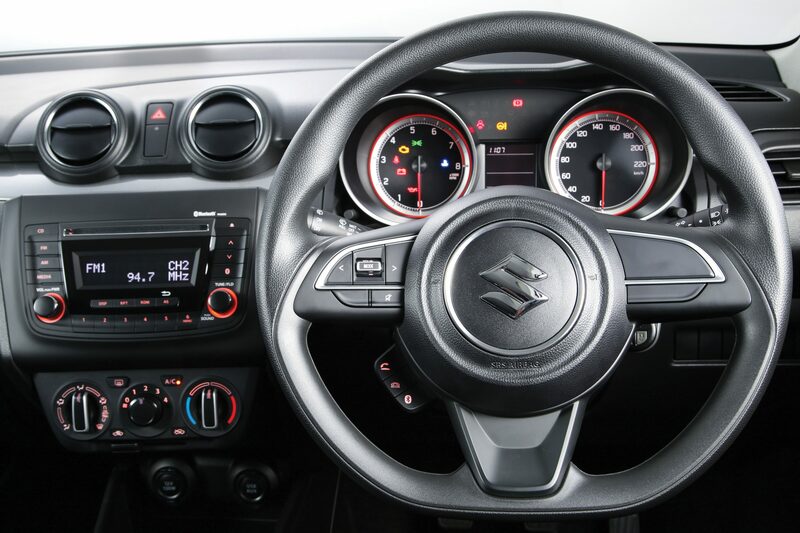 In addition, Suzuki has angled the centre console towards the driver and fitted the speedometer and rev counter in separate housings to accentuate the vehicle’s nature as a driver’s car. On the GL-specification level, Suzuki has added chrome accents and a chronograph-design to the driving cluster. All versions of the new Suzuki Swift are equipped with air conditioning, front and rear electric windows, power steering and remote central locking. All models also have a tilt-adjustable steering column, a detailed information display that includes information such as fuel consumption and range, and a security alarm and immobiliser. All versions of the new Swift have ample storage spaces inside the cabin, including two front and one rear cup holder, side door pockets, a console tray box, glove box with lid and a passenger seat pocket. The rear doors have additional bottle holders. 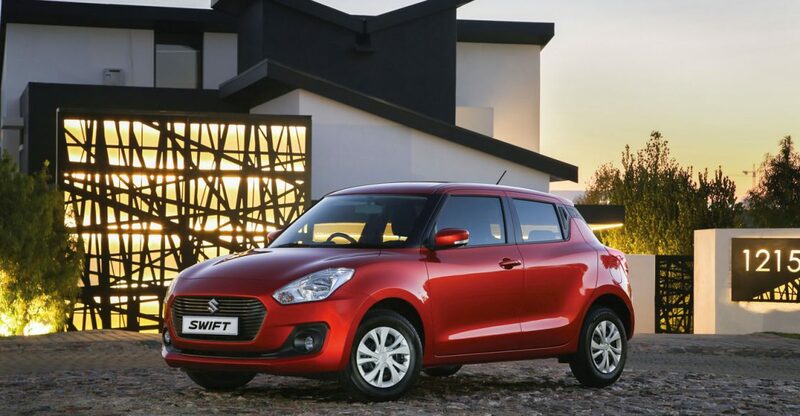 Suzuki’s new HEARTECT platform received much attention and praise when the new Suzuki Swift was named one of the 2018 Urban World Car of the Year finalists. The new platform is designed to use high-tensile and ultra-high tensile steel and has fewer joints than a traditional monocoque chassis. This creates a smooth shape and very stiff construction that helps to better dissipate energy in a crash, thus preserving the integrity of the cabin and keeping the occupants safe. But the new rigid platform also benefits the new Swift’s driving dynamics, with further improved tracking and steering feel. Suzuki has redesigned the MacPherson front suspension to best utilise the stiff platform and has added a variable ratio steering rack for more direct and sharper handling. The Swift’s steering set-up gives it a tight 4.8m turning radius. Suzuki’s engineers have also shortened the front stabiliser bars, redesigned the rear trailing arms and added a new cross-member to the rear suspension to make the driving experience even sportier. The new HEARTECT platform integrates with Suzuki’s Total Effective Control Technology (TECT), which applies the same design philosophy and engineering principles by using very high-tensile steel to lighten the body weight, while improving crash safety. The system was designed to integrate active and passive safety systems, including the two front-occupant airbags, ABS brakes with electronic brake-force distribution (EBD) and ISOFIX seat anchors, to create the safest Suzuki Swift 1.2 to date. An additional and very significant benefit from the new platform and body construction is the reduction in weight. The new Swift weighs in at an ultra-light 875 kg, which is a massive 95 kg lighter than its predecessor making it one of the lightest vehicles in the upper-B segment. 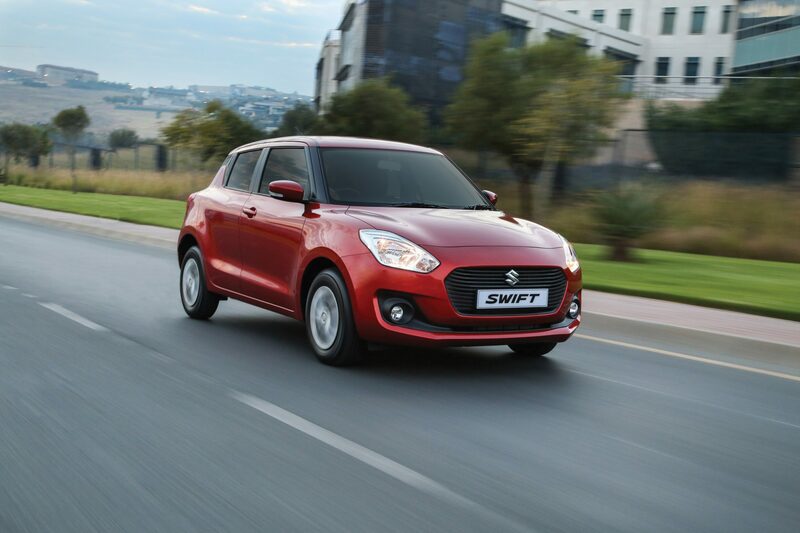 Suzuki South Africa will retain the Swift’s very popular K12M engine, which is renowned for its durability, reliability and frugal fuel consumption. The K12M four-cylinder engine is equipped with a relatively high compression ratio of 11:1, which in turn improves the engine performance and combustion efficiency, for lower fuel consumption. The engine delivers 61 kW at 6 000 rpm and 113 Nm at 4 200 rpm. The new Swift’s fuel consumption is rated at 4.9 litres per 100 km in a combined cycle, giving it a real-world range of over 750 km on its 37-litre tank. The K12M engine is mated to a five-speed manual gearbox in the GA-model, while buyers of the GL-model can choose between the same five-speed manual gearbox or an Automated Manual Gearbox (AMT) with the same number of gears. The AMT-gearbox is fitted with a self-actuating clutch and now features a ‘creep’ function to ease the driving load when parking or driving in stop-and-go traffic. Suzuki has also added a convergent locating system to the five-speed manual gearbox to create a lighter and more precise shift feel. 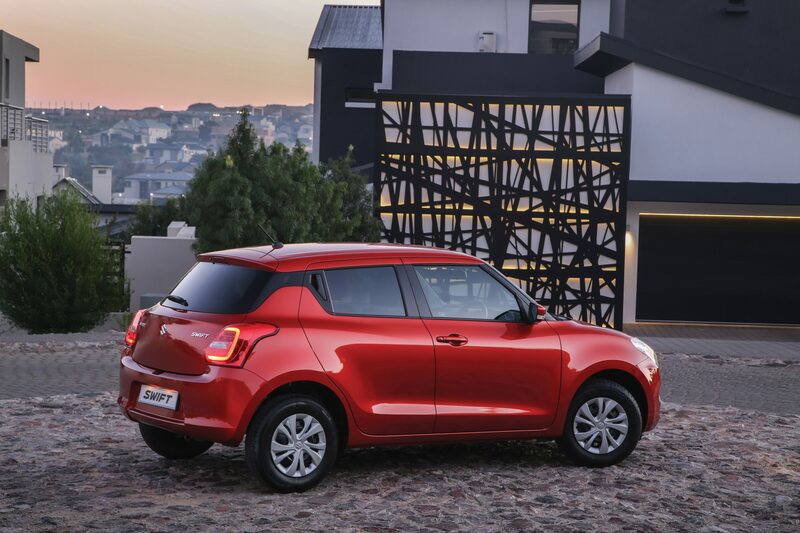 Both gearbox options feature gear ratios that are optimised for the K12M engine and the Swift’s sporty character. The Suzuki Swift will be available in three model derivatives. The GA-model offers an attractive entry-price to the range and is still equipped with a range of creature comforts, such as air conditioning, front and rear electric windows, ABS with EBD, ISOFIX child seat anchors and two airbags. The GL-model adds – amongst other features ­– colour-coded side mirrors, front fog lamps, a Suzuki audio system with steering-mounted controls and a rear luggage cover. This specification level has full wheel covers and is available with the choice of 5-speed manual or 5-speed AMT gearbox. 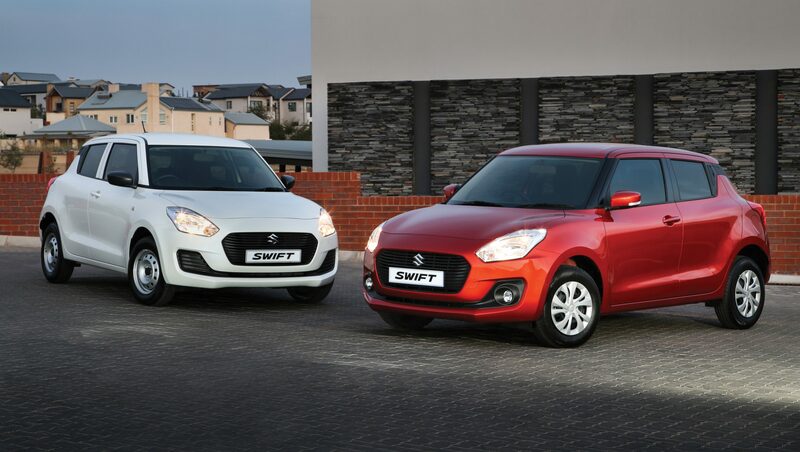 The all-new Suzuki Swift is available in six colours, namely Premium Arctic White, Metallic Silky Silver, Metallic Magma Grey, Premium Midnight Blue, Solid Fire Red, and the return of the popular Metallic Lucent Orange.